Aromatic herbs with a hint of sea salt, followed by a warming heat of black pepper and the robust, Earth tones of three chile peppers. 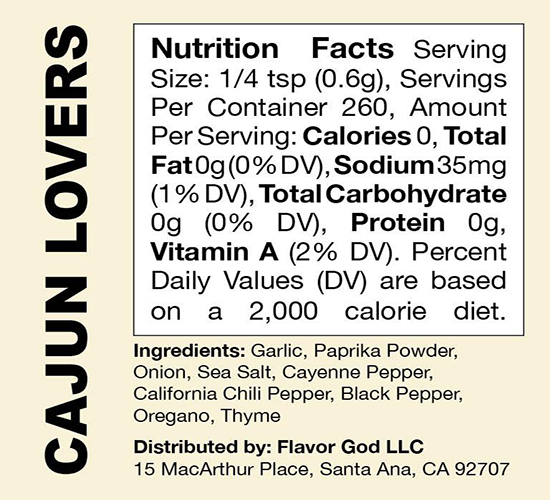 My Cajun Seasoning is perfectly BALANCED as an all purpose seasoning with the influences of Southern Regional Cuisine. Are these seasonings gluten-free & Kosher? YES, seasonings are certified Kosher. They have also been tested in a lab and are Gluten Free. Are the seasonings appropriate for meal preps? Absolutely!! Meal preps have a tendency to become repetitive and flavorless due to eating large quantities of foods in their most natural state for optimal nutrient consumption. Up until recently, athletes were eating for sustenance and to ensure that they were consuming enough calories per day according to their meal plans. 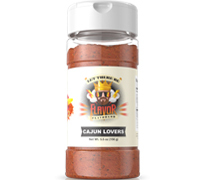 Now they can simply cook with their Flavor God seasonings or even shake the seasonings over their meals for an enjoyable experience every time they’re ready to eat. What is the salt content of your seasonings? Do you have any GMO’s, preservatives, or MSG in your seasonings? The seasonings are vegan and do not contain any of the above mentioned substances nor do they contain sugars, refined sodium, fillers, or anti-caking agents which tend to be either synthetic or made with animal by-products. Only the Ranch seasoning is not vegan as it has a dairy component for an authentic Ranch taste (it is still GMO, Preservative and MSG free).